In humans, there are four alkaline phosphatases, and each form exibits a characteristic pattern of tissue distribution. The availability of an easy method to reveal their activity has resulted in large amount of data reporting correlations between variations in activity and illnesses. For example, alkaline phosphatase from neutrophils of mothers pregnent with a trisomy 21 fetus (Down's syndrome) displays significant differences both in its biochemical and immunological properties, and in its affinity for some specific inhibitors. To analyse these differences, the biochemical characteristics of two isozymes (non specific and placental alkaline phosphatases) were expressed in baculovirus infected cells. Comparative analysis of the two proteins allowed us to estimate the kinetic constants of denaturation and sensitivity to two inhibitors (L-p-bromotetramisole and thiophosphate), allowing better discrimination between the two enzymes. These parameters were then used to estimate the ratio of the two isoenzymes in neutrophils of pregnant mothers with or without a trisomy 21 fetus. It appeared that the placental isozyme represented 13% of the total activity of neutrophils of non pregnant women. This proportion did not significantly increase with normal pregnancy. By contrast, in pregnancies with trisomy 21 fetus, the proportion reached 60–80% of activity. Over-expression of the placental isozyme compared with the tissue-nonspecific form in neutrophils of mother with a trisomy 21 fetus may explain why the characteristics of the alkaline phosphatase in these cells is different from normal. Application of this knowledge could improve the potential of using alkaline phosphatase measurements to screen for Down's syndrome. Alkaline phosphatase (AP, orthophosphoric monoester phosphohydrolase, alkaline optimum, EC 3.1.3.1) is a group of ubiquitous enzymes found in nearly every organ. So far, four different human isoenzymes have been identified: the tissue non-specific isozyme (NSAP) is expressed in numerous tissues , while the three specific genes have more restrictive expression: in intestin (intestinal AP; ), placenta (PLAP; [3, 4]) or thymus and testis (germ-cell AP; ). AP are zinc-containing dimeric proteins which catalyze the hydrolysis of phosphomonoester with release of inorganic phosphate and alcohol at alkaline pH. The catalytic mechanism was first deduced from the structure of the bacterial enzyme and was recently confirmed from the structure of a human isozyme . It involves the activation of a serine by a zinc atom, the formation of a phosphorylenzyme, the hydrolysis of the phosphoseryl by a water molecule activated by a second zinc atom and the release of the phosphate or its transfer to an acceptor. Four main catalytic functions have been attributed to these enzymes, hydrolase activity on low molecular weight phosphomonoesters , phosphotransferase activity , protein phosphatase activity  and pyrophosphatase activity . The physiological role of AP is poorly known, except for the involvement of the NSAP isoenzyme in the mineralisation of bone tissue . In blood, only NSAP is found in the serum  and in neutrophils [14, 15]. These cells contain a wide variety of enzymes functionally active in host defense. Among them AP, probably serving in membrane upregulation, has been identified in specific inclusions, the secretory granules, representing a highly mobilizable storage compartment. AP is detectable in differentiated granulocytes, including myelocytes, meta myelocytes, band forms and segmented neutrophils. With pregnancy, AP increases in the serum. This phenomenon originates from the PLAP synthesized in the placenta from the 7th week of pregnancy which passes into the mothers serum [13, 16–19]. Besides this activity in the serum, the AP activity also increases in the neutrophils of pregnant women, but it is the NSAP isozyme which is responsible . As yet, little is known of the mechanisms regulating AP activity during the course of normal gestation. Three distinct mechanisms presumably act in combination to elicit AP activity: i) the physiological hyperleucocytosis occurring with a steady increase in leucocyte count during pregnancy ; ii) the rise in placental hormonal secretions, estrogen and mainly progesterone, results in an increase in AP activity correlated with an elevation of steady state mRNA levels as a consequence of enhanced gene transcription [22, 23]; iii) the induction by granulocyte colony stimulating factor (G-CSF), one of the most important modulators responsible for NAP activity . The characteristics of AP from blood neutrophils of women whose fetuses had trisomy 21 differ from those with normal pregnancies. An elevated AP activity has been reported in affected individuals . An ectopic expression of PLAP seems to appear since i) AP is more stable to heat and urea denaturation [24–26], ii) AP is more sensitive to inhibitors L-homo-arginine, EDTA, L-phenylalanine, L-p-bromotetramisole and sodium thiophosphate [26, 27] and iii) AP is less recognized by anti-NSAP antibodies and shows a reaction with anti-PLAP antibodies . These variations in the respective levels of expression of NSAP and PLAP in serum and neutrophils can lead to these enzymes being used as markers to detect trisomy 21 fetuses. However, this method has been reported to be controversial [29, 30] while others found it to be reliable [31, 32]. This discrepancy may originate from the difficulty of separating the two isozymes, NSAP and PLAP. Thus, we studied some of their properties after in vitro production of recombinant enzymes in baculovirus infected cells in order to provide data useful to differentiate the two isozymes. Inactivation of alkaline phosphatase by urea: effect of incubation of PLAP and NSAP with 7.4 M urea on activity. Analysis of data by non-linear regression gave an estimation of the two rate constants kd and kr for the two enzymes (Fig. 2). The renaturation rate constant (kr) was significantly different from zero confirming the reversibility of the urea denaturation. Placental AP appeared to be more resistant to urea denaturation than NSAP while the renaturation rate constants were not significantly different. Analysis of data led to the rate constant kd for the two enzymes (Fig. 3). Placental AP appears to be 15 fold more resistant than NSAP. 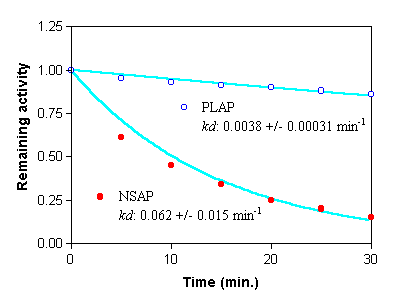 Inactivation of alkaline phosphatase by temperature: effect of incubation of PLAP and NSAP at 56°C on activity. Hydrolysis of p-nitrophenylphosphate by the two recombinant enzymes did not reveal any significant difference in their affinity for this substrate. Km were estimated to 171 +/- 12 μM and 180 +/- 15 μM respectively. For each enzyme, we observed a decrease of Km with pH (from 9.5 to 8) but without any meaningful difference between the two enzymes. Placental AP was more than four times more sensitive to this inhibitor than NSAP (Fig 4). 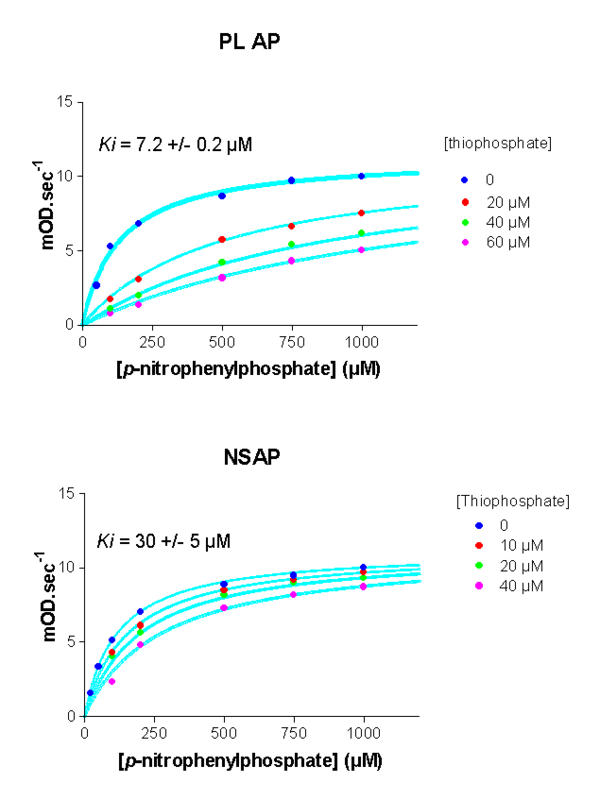 Inhibition of PLAP and NSAP by thiophosphate. L-p-bromotetramisole appeared to be a potent inhibitor of the two enzymes. Placental AP was more sensitive than NSAP (Fig. 5). Inhibition of PLAP and NSAP by L-p-bromotetramisole. 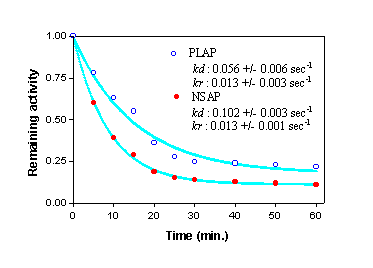 where kda represents the denaturation rate constant of the PLAP component, kdb, the denaturation rate constant of the NSAP component, and a the relative proportion of PLAP. As the rate constants were already determined, the fit allowed the proportion of the two isozymes to be unambiguously determined. In non pregnant women, PLAP represented 13% of the total AP activity of neutrophils. This proportion did not significantly increase with normal pregnancy. By contrast, in pregnancies with trisomy 21 fetus, we found a mean of PLAP of 67%. Analysis of nine individuals revealed that PLAP proportion in neutrophils varied from 60 to 80% for pregnancies with trisomy 21 (Table 1). The same analysis was performed using the differential sensitivity to urea, to thiophosphate and to tetramisole and the same result was obtained: the proportion of PLAP in neutrophils reached 60–80% of AP activity in pregnancies with a trisomy 21 fetus. AP activity (nkat/mg. protein) and Percentage of PLAP in neutrophils of pregnant women pregnant or not and bearing either trisomy 21 fetus or normal fetus. Comparison of alkaline phosphatase isoenzymes necessitates their purification. As the preparation of reasonable amounts of purified alkaline phosphatase from human tissues is a rather complex undertaking , we chose to express two isozymes in vitro. The PLAP gene had been already expressed in vitro using transfected simian cells, baculovirus and Pichia pastoris[35–38]. Production did not significantly differ from the data reported by Davies et al., i.e. 10 U/ml. In the present study, NSAP was produced in baculovirus infected cells but expression was weak, about 5-fold lower than the expression obtained with PLAP. The lower stability of NSAP compared to PLAP may contribute to this under-expression of the NSAP isozyme. The kinetics of urea denaturation distinguish the two isoenzymes. Denaturation appeared to be monophasic in this study for the two enzymes. This is not in contradiction with the report of Hung and Chang  who evidenced a biphasic denaturation of the enzyme because in the first denaturation phase, the enzyme remains fully active, thus this step was not analysed in the present study. The relative resistance of PLAP to denaturation has been known for a long time. Here we confirm this result and we show that the stability originates from a decrease of the rate of the denaturation step leading to reversible non active form. The renaturation rate constant of the two enzymes were not significantly different. 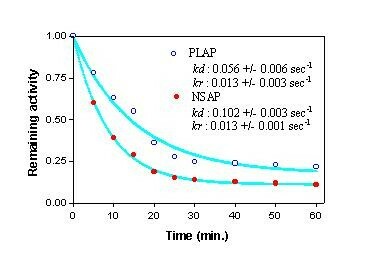 PLAP also appeared to be more stable than NSAP to temperature denaturation as first described by McMaster et al. and since repeatedly confirmed . As for urea denaturation, the stability seems to originate from a lower rate of the reversible denaturation while the denaturation rate constants leading to an irreversible denatured form were not significantly different. As denaturation of AP depends on the incubation buffer , we may hypothesize that it would be possible to find conditions for which differences in denaturation between the two enzymes are still more pronounced. By comparison with the GCAP isozyme, which differs from PLAP by only 7 aminoacids, Watanabe et al. identified glutamate 429 as the main amino-acid responsible for the relatively high stability of PLAP. The Km of PLAP for p-nitrophenylphosphate was slightly lower than the Km found by Chang et al.. Determination of Km with the human enzyme from the same source (Sigma) confirmed this difference suggesting that it rather originates from experimental conditions than from the in vitro expression of the enzyme. L-p-bromotetramisole appeared to be a potent inhibitor to AP with a slight specificity for PLAP compared to NSAP. 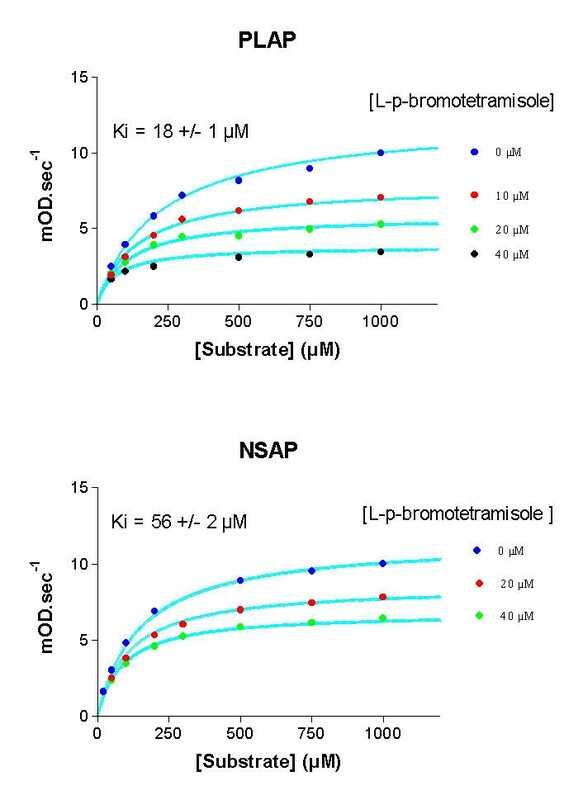 This result is in contrast with the data available for levamisole which, although related to L-p-bromotetramisole, is known to be specific of NSAP [8, 42]. NSAP activity of neutrophils have been reported to increase during pregnancy , and presence of a heat stable AP in neutrophils can be a useful marker for the screening of trisomy 21 fetuses . We sequenced the neutrophil NSAP phosphatase from trisomy 21 pregnant women and trisomy 21 children but no mutation was detected indicating that the differences in alkaline phosphatase characteristics do not originate from a mutant allele of the non specific alkaline phosphatase gene (unpublished data). This suggests that the heat stability of neutrophil AP associated with Down's syndrome may originate from the relative expression of PLAP and NSAP. Our results might indicate that PLAP is expressed in neutrophils and its proportion increases in Down's syndrome pregnancy. However, this conclusion is in contradiction with the report of Peleg et al. which reported no difference in AP stability in neutrophils of pregnant women bearing a trisomy 21 fetus. Among the hypotheses which can be proposed, loss of the PLAP component during enzyme preparation is possible since the authors discarded soluble proteins. The presence of PLAP can be used in conjunction with other markers in the serum of mothers which are currently used to detect Down's syndrome. The screening procedure using the serum concentration of alpha-fetoprotein, human chorionic gonadotropin, pregnancy-associated plasma protein-A and unconjugated oestriol combined with nuchal translucency has a detection rate of 85–90 per cent with 5 per cent false positives [43, 44]. So, using the presence of PLAP in neutrophils might improve the detection rate. Is the presence of PLAP in neutrophils due to the actual existence of a trisomy 21 fetus ? or is the presence of PLAP in neutrophils responsible for a predisposition of trisomy 21 pregnancy ? As neutrophils of trisomy 21 patients contain only NSAP [45, 46], we can reject the second hypothesis. Then the presence of PLAP in neutrophils is not genetically determined and seems to be a consequence of the presence of a trisomy 21 fetus. Nine blood samples from unrelated women bearing a fetus with trisomy 21 were examined. Patients were 36 +/- 6 years of age. Blood was collected during weeks 19 and 20 of gestation following amniocentesis and karyotyping. Two control groups, with same number of samples from women of the same age and at the same gestational age were done: pregnant women with normal pregnancy and not-pregnant women. The permission of all patients was obtained before blood was collected. Neutrophils were immediately isolated by the procedure of Gainer and Stinson . Extraction of the enzyme was immediately performed after blood taking and carried out in 25 mM phosphate buffer pH7 in the presence of 2% Triton X-100. The cells were sonicated and the homogenate spun at 10 krpm, 1 hour at 2°C. The clear supernatant was collected and frozen at -20°C before biochemical determination for less than three days. Preliminary experiments showed that congelation in these conditions did not affect the phosphatase activity. The NSAP encoding gene was cloned by RT-PCR and inserted into the baculovirus transfer vector pBacPaK9 (Clontech). Recombination in the virus BacPAK6 was performed by standard protocols . The placental AP was produced form the recombinant baculovirus constructed by Davis et al.. Enzymes were partially purified on DEAE columns and precipitated by acetone according to Masuhara et al.. Kinetic measurements were performed in triplicate at 37°C, at pH 9.5 in 0.1 mol/L diethanolamine-HCl buffer containing 45 mmol/L MgCl2, with an ionic strength maintained constant (0.2) with NaCl, using sodium p-nitrophenylphosphate as substrate. The amount of reaction product (paranitrophenate) was quantified using absorption at 400 nm (apparent ε = 18500 L.mol-1.cm-1 at pH 9.5). All the kinetics were carried out for at least 5 minutes and the initial velocities determined by the slopes using the software included in the Perkin Elmer UV-Visible spectrophotometer Lamda 15. The reversible inhibitors sodium thiophosphate and L-p-bromotetramisole (2,3,5,6-tetrahydro-6-phenylimidazo-[2,1-b]-thiazol; Fig. 1) were incubated for five minutes with the enzyme before the addition of substrate. Data were analysed by multiple nonlinear regression using a non-linear global optimization method based on simulated annealing (J. Czaplicki, V. Marcel and D. Fournier, manuscript in preparation) with equations solved according to the rapid equilibrium hypothesis. For inactivation studies, the concentration of native enzyme was calculated from the residual activity after preincubation of the protein either with urea or at high temperature, without substrate. Urea denaturation was carried out by incubating each protein with freshly 7.4 M urea solution in 0.1 mol/L diethanolamine-HCl buffer pH 9.5, 45 mmol/L MgCl2, 0.2 ionic strength at 20°C for 30 minutes. The variation of the remaining proportion of non-denatured enzyme with time was estimated by sampling aliquots every five minutes and recording the remaining activity. As a control, the remaining activity was determined by incubation of proteins without urea. Heat inactivation used the same protocol but incubation was at 56°C, 65°C or 70°C. As the results obtained at the three temperature are in accordance, only the results obtained at 56°C are presented. We are indebted to the patients whose cooperation made this investigation possible. This work was supported by a grant from the Mutuelle Générale de l'Education Nationale.